The Milky Way Galaxy is the galaxy that contains our solar system. Milky Way also refers to the diffuse band of light that arcs across the summer sky from Sagittarius in the southeast to Cassiopeia in northwest. It’s name is derived from its “spilled milk” appearance. I recall seeing the Milky Way often as a child growing up in semi-rural Georgia, but I have not been able to see it where I presently live because the light-polluted sky is brighter than the Milky Way. It is best seen as far away from city lights as possible, and on a Moonless night. What I hope to do in my treatment of the Milky Way is relate the band of light that is seen stretched across they sky to the structure of the spiral galaxy that the Milky Way actually is. In order to make this leap, I must do three things: 1) describe a spiral galaxy’s structure and appearance by using far away galaxies and a Frisbee as proxies, 2) describe the Solar System’s location within the Milky Way Galaxy, and 3) take an imaginary journey to our location inside of the Milky Way Galaxy. Before proceeding, it will be helpful for us to reacquaint ourselves with light and time, and their relationship to distance. Light travels in photons that are either emitted from hot objects like light bulb filaments, or reflected off of cooler objects, like the walls. The Sun and Moon are also emission and reflection objects, respectively. Photons travel from their source to our eye or camera sensor at, well, the speed of light. We can express this speed in terms with which we are already accustomed, like miles per hour (mph). Since light travels at 186,282 miles per second, that equates to 670.6 million mph. That is incredibly fast! Since mph has a distance component (miles), we can use the speed of light, or the speed of anything else, to measure distance. If something is 670.6 million miles away, we can also say that it is one light-hour away. The amount of time involved essentially becomes the yardstick. The Moon is about two light-seconds away. The Sun is eight light-minutes away. A light-hour does not get us all the way to Saturn, and the closest star is four light-years away. Galactic sizes are on the scale of hundreds of thousands of light-years, and intergalactic distances are on the scale of millions and even billions of light-years. There’s nothing like the distances across the vast emptiness of space to make light seem to flow like molasses. An implication of light’s incredibly slow speed is that our eyes are essentially time machines. The point at which Saturn appears in the sky is actually where it was over an hour ago. Similarly, The Andromeda Galaxy, our closest galactic neighbor, is seen as it was 2.5 million years ago. A supernova detected today in a galaxy located 11 million light-years away actually happened 11 million years ago. With your mind sufficiently bent, let’s proceed on our three-step journey to “see” our place in the galaxy. We can learn much about the structure of a spiral galaxy by observing neighboring galaxies that we can see from various perspectives. We learn from these observations that a typical spiral galaxy is a disk that is thin at its edges, and becomes thicker at points toward the center. There are essentially three perspectives that matter: face-on, edge-on, and in any perspective between the two. The first perspective to consider is that of a galaxy viewed edge-on. From this perspective, a galaxy’s profile is thin at its edges and it grows increasingly thicker toward the center, and there is a noticeable bulge at the galaxy’s center. The line of sight is through the longest dimension of the disk, so billions of stars contribute to a distant galaxy’s faint glow that we perceive through an amateur telescope. These features can be seen in NGC 4565, which is an example of an edge-on galaxy located about 43 million light-years away. Zoom in on the image at the link and notice that there are brighter areas were masses of stars can be seen, and other areas where the stars are obscured by dust lanes. A Frisbee flying toward you at eye level would present a profile similar to that of an edge-on galaxy. The second perspective to consider is that of a galaxy viewed face-on. It will appear as a near perfect circle with spiral arms of dust and stars. Generally, a face-on galaxy will be brighter in its center, because stars are more densely aggregated about the galactic center, and because the disk is thickest at the center bulge. 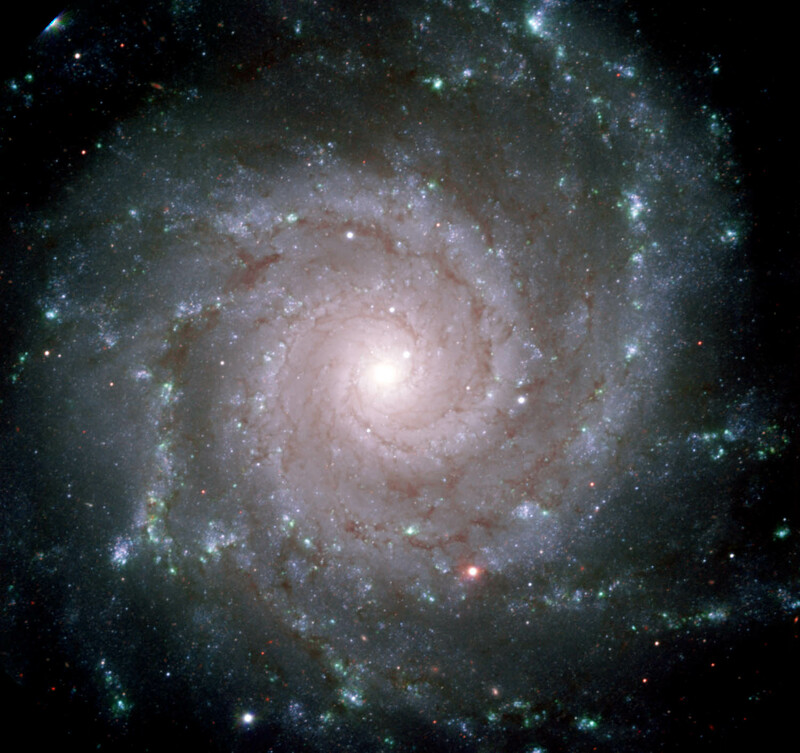 Messier M74, located about 32 million light-years away, is an example of a galaxy viewed face-on. Click on the image and zoom in, and again notice the bands of stars and bands of dust. A Frisbee seen lying on the ground has a similar circular profile. A third perspective would be a view from any perspective other than edge-on or face-on. The profile of such a galaxy is elliptical, with the flatness of the ellipse being related to the offset angle. Messier M31 (Andromeda Galaxy) is an example that is located 2.5 million light-years away, which makes it the Milky Way’s closest galactic neighbor. 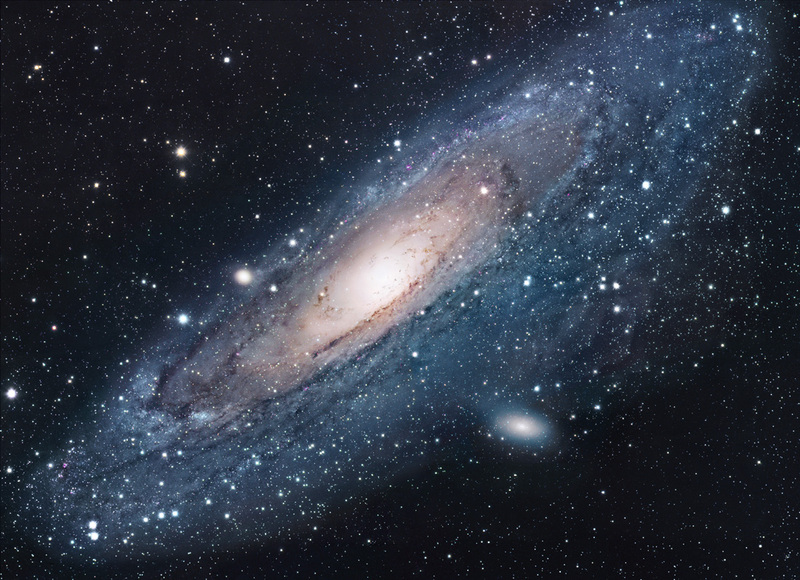 Our Earth-bound view of M31 is about half way between edge-on and face-on perspectives. Zoom in on the image at the link to see all of the features previously described in the face-on and edge-on perspectives of galaxies. Even though a galaxy contains billions of stars, it is important to keep in mind that a galaxy is mostly vast tracts of empty space. Our galaxy is so vast in size that we can only see a tiny bit of it. It is believed to be about 120,000 light-years in diameter and it is believed to contain about 250 billion stars. In contrast, the farthest star that we can see with the unaided eye is a very bright one that is about 4,000 light-years away, but something on the order of 500 light-years is typical of the most distant stars that we can easily see from Earth. Within this radius, that are only about 5,000 individually resolvable stars that can be seen by the unaided eye. When stars are viewed at greater distances, they are too dim to resolve individually and the apparent distance between stars grows smaller. As a result, when looking toward the center of our galaxy where stars are more densely packed, we see literally billions of stars that are too dim to be individually resolved, but the combined effect of these billions of stars is that they are perceived as a diffuse patches of light. 2. Location of the Solar System. The solar system is located within the flat disk of the Milky Way Galaxy, and is about 27,000 light-years from its center. Since The Milky Way Galaxy’s diameter is 120,000 light-years, its radius is 60,000 light years. Thus, we are located just inside a point about half way between the center of the galaxy and its outer edge. Since there are more stars concentrated in the galaxy’s center we will see more stars when gazing in that direction than when we are gazing outward toward the nearest edge where stars are more sparsely spread. To mark a corollary of our location on say a 10″ Frisbee, one could put a star sticker about 4 1/2 inches from its center. More precisely, our location is beneath the star, somewhere about half way between the top and bottom of the Frisbee’s cross section. Let’s begin our imaginary journey to the Solar System’s location within the Milky Way Galaxy. In order to scale this journey down to something we can more easily understand, we will once again employ the Frisbee proxy. To orient ourselves, lets first stand near the Frisbee and look down upon it observing a profile similar to the face-on view of the galaxy. Note the location of the star sticker that we put on the Frisbee to mark our notional location. Now place yourself at a point where you are on a line drawn outward from the center of the Frisbee through the star sticker, and now take three or four steps away from the Frisbee in the direction of this line, and place your eyes down at ground level so that the Frisbee is viewed edge-on, and imagine that the Frisbee is our own Milky Way Galaxy. Initially, the view of the galaxy will appear similar to the example edge-on galaxy, NGC 4565, that we examined earlier. Please have this image fresh in your mind before we start moving, because this is how our galaxy appears from our initial vantage point. At long last we begin our journey, and as we approach the Milky Way Galaxy, its appearance does not change much from the edge on view of NGC 4565. It will only grow proportionately wider and thicker in size as we move closer to the Milky Way’s center. At about 300 light-years from the disk’s edge, individual stars immediately ahead become individually resolvable. A glance in the direction away from the Milky Way is eerily devoid of stars . Once inside the edge, the nearest stars will begin to “fly” past us in a manner similar to what is seen on certain Windows screen savers or on Star Trek. Ahead of us we still see the patchy fog of the dense galactic core as the backdrop for the foreground stars, and behind us we can see some stars, but against a completely dark backdrop. Finally, we reach the Solar System and stop. Because an overwhelming majority of all the Milky Way’s stars are still ahead of us in its dense center, the only significant change in the galaxy’s appearance since we began our journey is that it grew wider and thicker as we moved closer. Now that we understand a spiral galaxy’s structure and appearance, know our location in the Milky Way Galaxy, and have seen what happens as we fly into the galaxy from its edge, let’s now examine a fish eye photographic image of the Milky Way on the National Geographic Web site. The Milky Way appears as an arch in this image due to fisheye distortion, so to get a true perspective, imagine that the arch is straightened out. Compare this Milky Way image with the edge-on image of NGC 4565 previously viewed. Can you see…bright patches of unresolved stars? …dark dust lanes? …a flattened, edge-on disk? …a bright central bulge? Armed with enough information, it is possible to gaze upon the Milky Way as seen in the summer sky from Earth and understand that it is actually the disk of the Milky Way Galaxy!